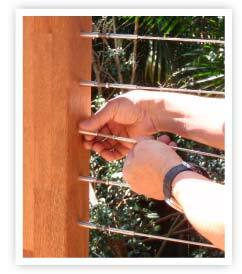 Stainless Cabling Systems provide a timber screw spigot system between timber posts that is quick and easy to install and eliminates the use of cumbersome items such as eyebolts, shackles and turnbuckles, etc. Also available are wood screw spigots to steel post spigots. 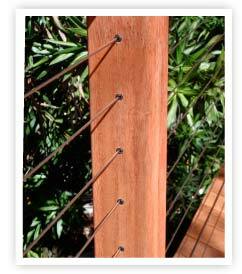 This enables the use of Stianless Cabling Systems between timber and hollow steel post combinations and steel to steel hollow post combinations. A drill, counter sink bit, Phillip's head drive bit and tension spanners can be purchased with your order if required. This set is not a requirement but provides all the pieces for easy installation once acquired. 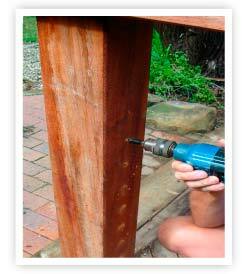 Make up a template to pre-drill the posts with even spacings. Any old fence paling will do. 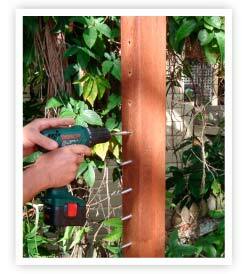 This reduces time of measuring each hole to be drilled for each post. Using the counter bore drill bit , drill approximately 9-10mm in depth of the counter bore drill bit. Insert the Phillips drive bit into timber spigot or timber bullet and ensure to apply pressure to secure the fitting into the post. 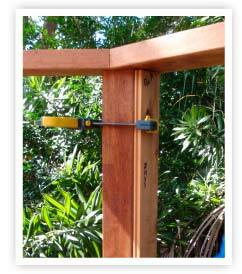 Drive the component into the timber post until the lip of the spigot sits flush with the post (bullet does not have lip and sits inside the counterboard recess as in Step 3). Allow component to rotate as this is the tensioning system. There is one spigot for each outside post. The cable will pass through all the intermediate posts. If passing cable through intermediate posts, drill a 10mm hole straight through all intermediate posts. Remove the 8mm AF lock nut from the swage stud and slide a rubber grommet over the stud and cable. One grommet on entry & exit of the intermediate post. After the cable has passed through the post, push the grommet into the post using a small flathead screwdriver or similar. Once grommets are installed ensure to refit the 8mm AF lock nut onto the swage stud terminal. 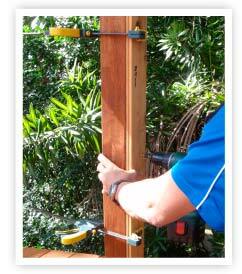 Turning the timber spigot clockwise by hand, tension the pre-swaged cable and swage stud . This is done at both outside posts. 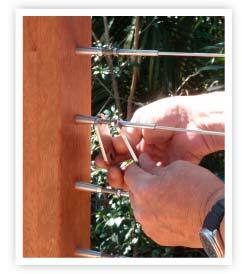 Using cable spanners , hold the swage stud with spanner #1 and rotate the timber spigot or bullet clockwise with spanner #2 until the required tension is achieved. To lock the system off, hold the spigot or bullet with spanner #2 (do not rotate) and tighten the 8mm AF locking nut with spanner #3. Click on the following to download and view our installation information and guide. Please Note: In order to open and view the Instruction Guide (pdf) please ensure that you have Acrobat Reader installed. To obtain this Free Adobe software please click here. Click link to download & view our Easy Installation Guide.